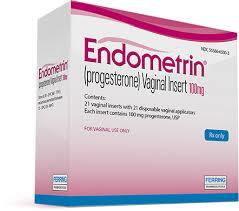 Endometrin (progesterone) Vaginal Insert 100 mg is a brand of micronized progesterone tablet inserts. Endometrin is used to support embryo implantation and early pregnancy by supplementation of corpus luteal function as part of an Assisted Reproductive Technology (ART) treatment program for infertile women. Side effects that may occur include: Abdominal pain, nausea, abdominal distension, vomiting, fatigue, urinary tract infection, headache, uterine spasm, vaginal bleeding, breast tenderness, bloating, mood swings, irritability, and drowsiness. If you experience an allergic reaction: difficulty breathing; closing of the throat; swelling of the lips, tongue, or face; or hives; seek emergency medical attention immediately. Endometrin may be stored at room temperature. Endometrin administered as a progesterone vaginal insert is indicated to support embryo implantation and early pregnancy by supplementation of corpus luteal function as part of an Assisted Reproductive Technology (ART) treatment for infertile women. The dose of Endometrin is a 100-mg insert, administered vaginally two or three times daily starting the day after egg retrieval and continuing for up to 10 weeks' total duration.